James Anthony Torbert was born on 20 February 1853 in Alabama. Thomas Jefferson Torbert and Rebecca Priscilla Sledge appeared in the US federal census of 1 June 1860 in Marengo County, Alabama. Other members of the household included James Anthony Torbert, Sylvester Sledge Torbert, Edward Everett Torbert and Edna Emma Torbert. Thomas Jefferson Torbert and Rebecca Priscilla Sledge appeared in the 1866 Alabama state census in Marengo County, Alabama. Other (counted but unnamed) members of the household apparently included James Anthony Torbert, Sylvester Sledge Torbert, Florence Torbert, Edward Everett Torbert, Edna Emma Torbert and Thomas Jefferson Torbert Jr.
Thomas Jefferson Torbert and Rebecca Priscilla Sledge appeared in the US federal census of 1 June 1870 in Spring Hill Beat, Marengo County, Alabama. Other members of the household included James Anthony Torbert, Sylvester Sledge Torbert, Edward Everett Torbert, Edna Emma Torbert and Thomas Jefferson Torbert Jr.
Thomas Jefferson Torbert and Rebecca Priscilla Sledge appeared in the US federal census of 1 June 1880 in Spring Hill, Marengo County, Alabama. Other members of the household included James Anthony Torbert, Thomas Jefferson Torbert Jr. and Alexander Torbert. He and Anna Mary Pegues obtained a marriage license on 11 December 1880 at Marengo County Probate Court, Marengo County, Alabama; with James A. Torbert and Thos J. Torbert serving as bondsmen. 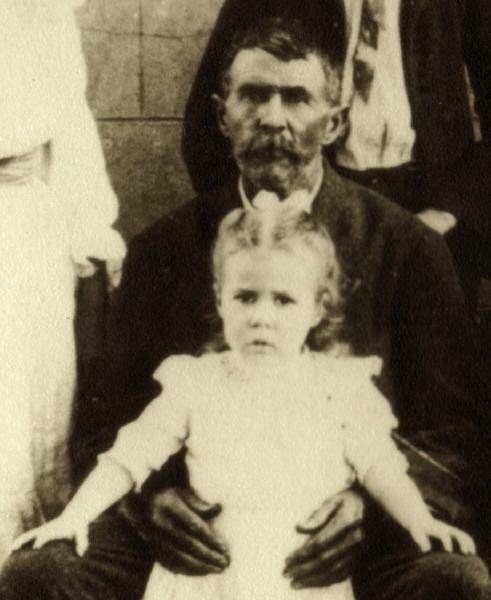 He married Anna Mary Pegues, daughter of James Bartholomew Pegues and Ann Eliza Brodnax, on 15 December 1880 at Faunsdale, Marengo County, Alabama. The following appeared on 30 July 1903 in The Montgomery Advertiser: The following appointments were announced yesterday from the State Executive Department. . . . Notaries Public and Justices of the Peace -- J. A. Torbert, Marengo County; George W. Stevens, Randolph County. . . . The following appeared on 17 June 1909 in The Montgomery Advertiser: (Demopolis, June 16) J. A. Torbert, a reliable and highly respected merchant and planter residing near Torbertville, was in Demopolis Tuesday and informed the people that there was no exaggeration of the report of the hail storm in that neighborhood last week, either in the size of the hail stones or the damage done to the crops. He says he actually handled hail stones as large as a man's fist, and that there was in some spots a total annihilation of the crops. But he says the people residing in that vicinity have not yet given up; the crops have been replanted and work began with renewed hope to retrieve their losses. In 12 September 1918, James Anthony Torbert and Anna Mary Pegues were living in Gallion, Marengo County, Alabama, according to son Sylvester's WWI draft registration. 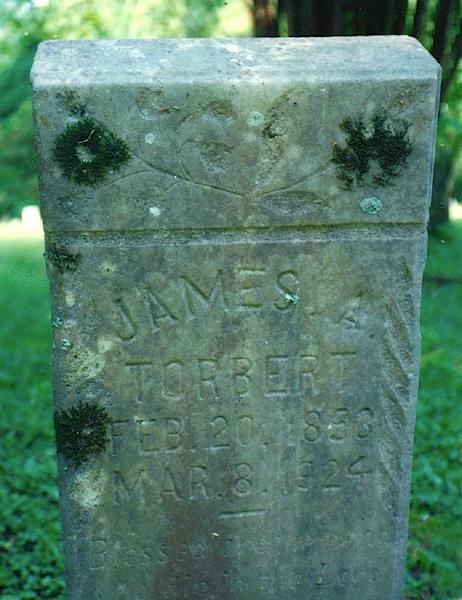 James Anthony Torbert died on 8 March 1924 at age 71 in Old Spring Hill, Marengo County, Alabama, or 9 March. He was interred at Old Spring Hill Methodist Cemetery, Old Spring Hill, Marengo County, Alabama.